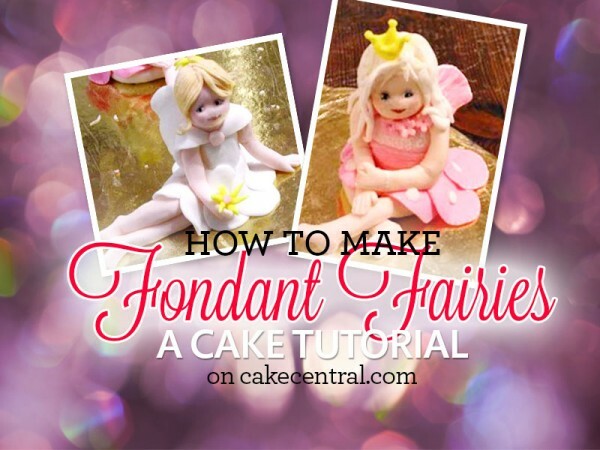 Learn to make an adorable little fondant fairy with step-by-step photos and instructions. 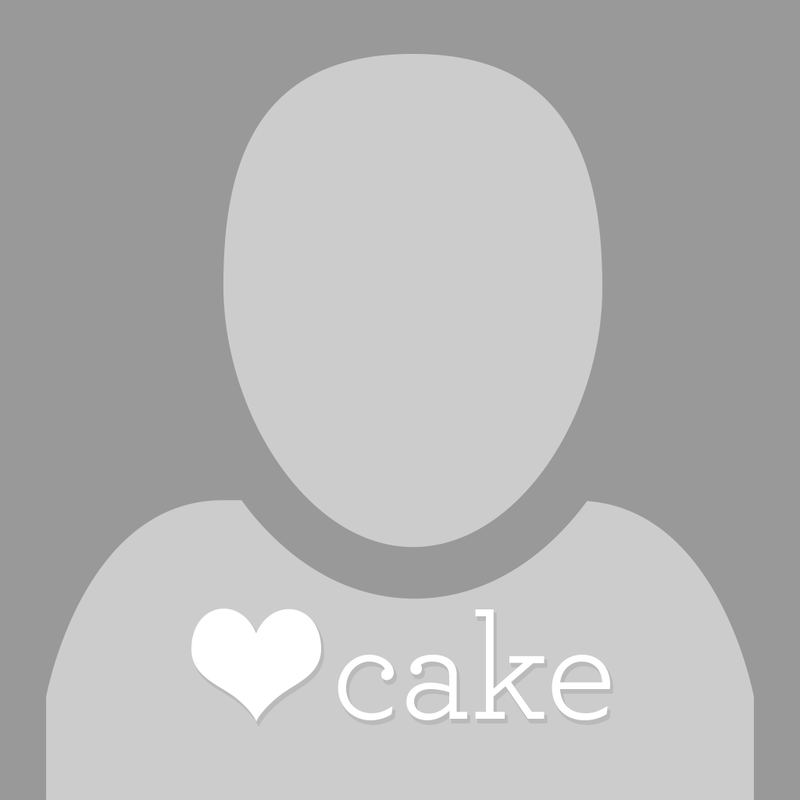 These sweet figures make wonderful cake toppers. 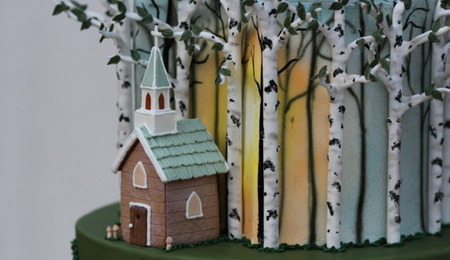 You need to color your fondant first to get all of the colors you need. For the skin color I used a little ivory and soft pink. Make enough for hands legs and head. 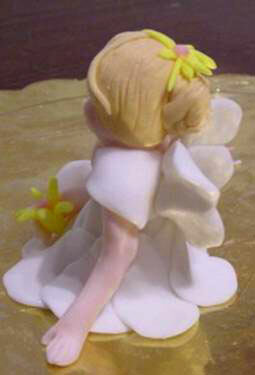 Choose your dress, accessory and hair color and prepare the fondant. If you don’t have mold for the face, make one from gumpaste and dry it for a few days. My mold for the face was made from this doll. Prepare the plate or a base for your figure. I always cover any base with plastic wrap. 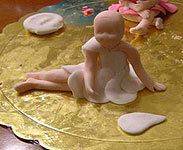 It will make it easier to get your figure off the base to put it on the cake. I always start with the legs. Make two legs and place them in the position you want on the base. Position your molded legs the way you want. Then add the body. You should make the body piece pretty skinny as you will be adding fondant to it, and it can became easily very fat looking fairy. Add the body. 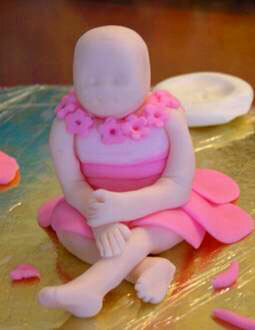 It is good to add some Gum-Tex™ in the fondant for the body so it will keep its shape. You don’t need to add Gum-Tex™ for any other part except if you want the hands to stay up without support. 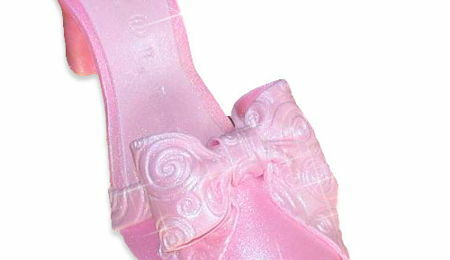 When you have made the body, make the head, and start the skirt or dress. 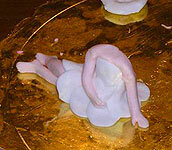 For the skirt, I used flower petal-type pieces. When finished with the dress, I made sure that I haven’t pressed the pieces too tight on the board. With a thin spatula, unglue them and change their places. You could also put some icing sugar on the base for easy removal later. 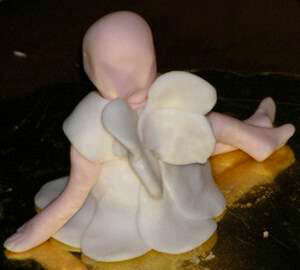 It is easy to do if fondant hasn’t dried yet. If your body is the color you want for the upper part of the dress mold out the hands. If not, make the upper part of the dress. If you want to decorate the collar, then now it is the time to do it. Also add the pre-molded head and sleeves if you wish. Create basic hair, and then add tiny rolled lines to make curly hair. This is the part that takes most of the time making the figure. Now paint the face and detail on the dress. 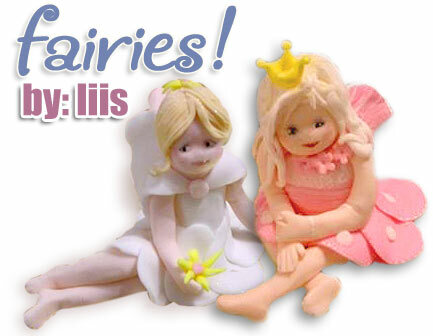 Create wings from petal shapes, and you have your finished fairy. Making a face mold out of gum paste, you're a genius! * snickering evil laughter in the background, must find my daughter's old barbies! The hunt is on! 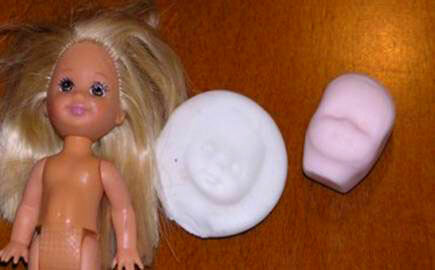 for the people with questions about the face mold, take a flat piece of gum paste and press it around the baby dolls face so all the details are on the inside of the mold, make it thick enough so the paste wont break. when it is completely dry you can put the fondant in. Take the face out gently and adjust it into the shape of the head, the back will be covered by hair, so don't make it too round. 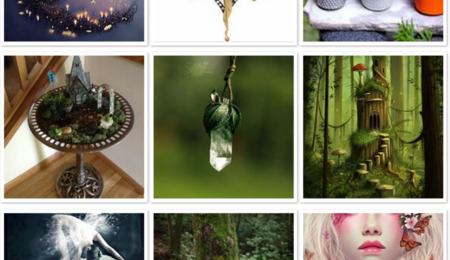 Have a closer look at the background of picture 1,4,5,6 (not counting the large white fairy picture at the top) good luck! Thank you so much for this tutorial. it helped me beyond words. it was easy too. 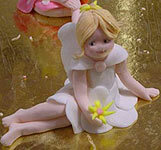 made the pretty fairies with tylose and fondant. 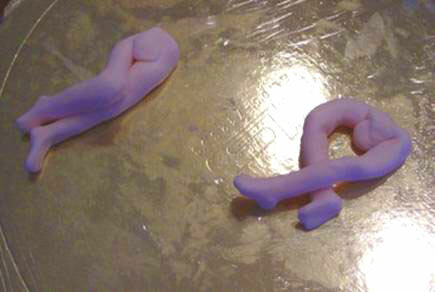 i cheated though, and purchased a mould for the face and limbs. couldnt have got the outcome that i did without this tutorial. 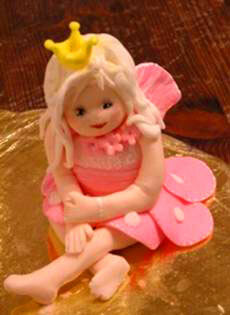 Have a look at my Fairy and Book cake. thank you once again for sharing it with all of us. God bless you for your kindness. Thank you so much for sharing your talent! I cannot wait to try this!